When Russian immigrant Harry Ferer first opened his typewriter sales, rental and services business, he had no idea what he started: a 100-year legacy of trust, loyalty, honesty and family that continues at All Makes today. Now one of the Midwest’s largest office furniture and technology dealers, All Makes remains dedicated to moving business forward for more than 6,000 business clients in Omaha, Lincoln and Kearney, Nebraska and Des Moines, Iowa. 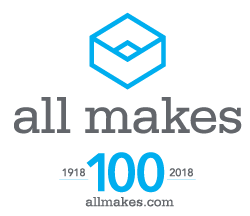 We will celebrate our 100 years throughout 2018, beginning with video testimonials from our owners, clients, employees and suppliers. We recently wrapped our BIG giveaway worthy of a century of not just doing business, but doing good business: the 100 Year, $100,000 Office Makeover Contest! We donated brand-new office furniture from Allsteel and Hon, state-of-the-art Kyocera Copystar copier and a fresh conferencing solution, the Meeting Owl from Owl Labs, to the lucky winners. Click here to see who took home the prizes! Watch our newest 100 Year Anniversary videos below!